Find your Ring Size at Tiffany Jones Designs. Don’t know her ring size and want to keep it in surprise, there are few why to know her ring size. One way is to ask her mom, sister or best friend, they might know her finger size. Another way is borrow her ring (from the correct finger) and use one of the methods below to determine its size. You can take the ring to any jewelry store and ask to them to clean the ring, most stores will perform this service free of charge and then ask the jeweler to check the size of the ring for you. You can ship the ring to us; we will measure the size and ship it back to you. 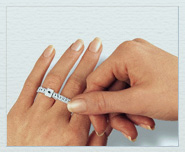 You can use a ruler to find your ring size. Slip the ring on your finger and mark the spot it fits. Then cut a thin strip of paper that can comfortably wrap around the finger. Mark the spot on the paper where it completes a circle. Measure the strip of paper and match your size. 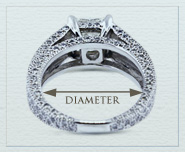 For example: if the length is 51.8mm than your ring is size 6. Download the page below for complete chart. Download our ring sizer page and place the ring over the circles. Match the ring to the circle that completely fills the inside of the ring without overlapping. The size written inside the matching circle is your ring size. Please note: You need to take the knuckle into consideration when sizing. In some cases the bottom of the finger may be smaller than the knuckle. Also take into consideration your knuckle size when purchasing a ring with a wider band which should be sized ½ -1 size larger. Women’s rings typically range from size 3 to 9. The most commonly purchased women’s ring sizes at Blue Nile range from size 5 to 7. Size 6 is the most popular ring size. Each customer is entitled to one free ring resizing within 60 days of purchase. Please note: Eternity bands and tension rings that cannot be resized and must be completely remanufactured.